I remember reading a fragment of a quote from Robert Harris, an English novelist, he stated “… The mountains are the same, but they look very different.” Since that very warm weather of 2015, when the sun had ideas of its own and relished scorching the land until there was no room for a relief of rain any time soon. I have been quietly reassessing that point. In July of that year, I guess it was five days before Eid al-Fitr, after nearly a half-decade, I visited the house of my grandparents from my dad’s side again after my grandfather passed away a couple years before. They lived in Kampung Laut, Jambi for maybe more than a half-century. It was a village, located on the edge of the Batanghari River, which was the longest river on the island of Sumatra. Its water quickly rose when the rainy season came; otherwise, it rapidly receded during the dry season. Back in five years, we used to stop the car at the end of the highway then continue our trip to the village by a speedboat, actually it was more like a jon boat; typically had a transom onto which an outboard motor can be mounted, since the road was not able to cross by heavy vehicles. Plus, it was way faster. At that moment in 2015, our car could already go straight to one point close to the village. However, we still had to shift the vehicle to a motorbike because, again, the road didn’t have that much capability to hold bigger vehicles such as cars to pass since it was made of pieces of wood. Just in case and even prevented the occurrence of unpleasant accidents. Coming back to Kampung Laut after an absence of many years was a surprisingly not a really confusing experience, well even though it was a little like waking up from a quite long coma. The houses in this village were indistinguishable, it surely difficult to tell them apart; it was built on a swamp, around the mangrove area with the atmosphere of the Malay tribe’s culture of Jambi and Batanghari River was trusted to be a source of livelihood for generations. No, the houses were not that all dreamy like a typical beach house or something like that, the exterior of the house had suffered many sunrays heat and stricken storm seasons, though the old wooden walls had been pretty well sheltered inside. Moreover, the old wooden floors that always squeaking as we walked around the house; it was pretty loud since I was there with my whole family, which contained numbers of kids running and screaming with delight. The gentle scent of my grandfather kindled memories of those good old days gone along the way with his departure to the God Almighty; I wish I could turn the pages back and dwell on the fine details. But it wasn’t all that sad and noisy though, due to the fact that with only stepping out our feet at the patio of the house, we could have a wonderful experience to watch sunset and sunrise; the sky mellow blues and orange blurred together in a cinereous mist to create another magnificent scenery. Even though the river was not as clear as glass, the sky remained beautiful. Yet, there were fishermen’s boats or skiffs that traditionally used as a utility for fishing which could have only a small crew. They bobbed on the river surface depended on how strong the wave that they were handling at that moment. The boats were creaking, tugging on their moorings to the dock. To be honest, that view was not really pleasing but it was a normal thing around here. On one late afternoon, when the light of day seemed giving it away to the darkness, the sun almost sunk lower in the sky just enough to announce sunset coming, my dad asked one of the neighbors a favour to take me, my siblings, and my cousins for a short ride with their speedboat to enjoy the early evening. The wave made the boat bouncing softly on the river surface that coated our skin in a soggy mist of water. The river was so wide; it felt like we were sailing on the sea, even though the water looked like it contained chocolate, trust me there was no cocoa powder or liquid inside the river, it was just a turbid brown from eroding the dirt soil at the bottom of the river. That short speedboat ride enjoying the nature of my grandparents’ home was such a treasure, my sanctuary from the busy hustle and bustle of my life in the city. Yet, the sound of the speedboat’s motor was really noisy; it was like strapping the space jets to a boat, or I thought it was as deafening as the sound of rickshaw’s engine. Without realizing it, the ride arrived at its end then we got to get back to the house. Since it was still on Ramadanmonth vibes and the sun was almost set, soon after we arrived at the house we broke our fast together. Since Kampung Laut was one of the largest fish suppliers to provide the needs of the people in Jambi, the star of every iftar we had was the seafood; it was the specialty of every meal, water creatures drizzled in sauce or even begging to be dipped in spicy and savoury concoctions. The whole family gathered in my grandparents’ somewhat family-sized dining room that merged with the kitchen to jointly enjoy breakfasting. There was no grandiose solid mahogany table with a tablecloth or even a chandelier that had been hung in pride of place above it as the decoration; all of us were sitting on the old wooden floor covered with a large rug with various patterns accompanied by dim lights. My three-year-old little cousin placed a pile of a quite huge shrimp that almost looked like a lobster; we called it udang nenek, on his plate and drenched them in a creamy, sweet sauce. His pudgy hand clenched the oil-soaked shrimp and stuffed them into his mouth. He licked his fingers, smeared with cream and oil. It was kind of a stomach-churning view, but he was a very adorable toddler so it was acceptable. Besides, I had to admit that the food was as delicious as they looked and smelled so mouth-watering. As well, there had been the constant, unexpected joy of reencountering all those things I missed for a few years but had not largely forgotten. I was absent from probably about five years of the most significant transformation of this village, but I was excited about the many new experiences in store for me in the future visit; as I moved forward, I would never let the memories left behind and forgotten. I would take that value of opportunity with me. 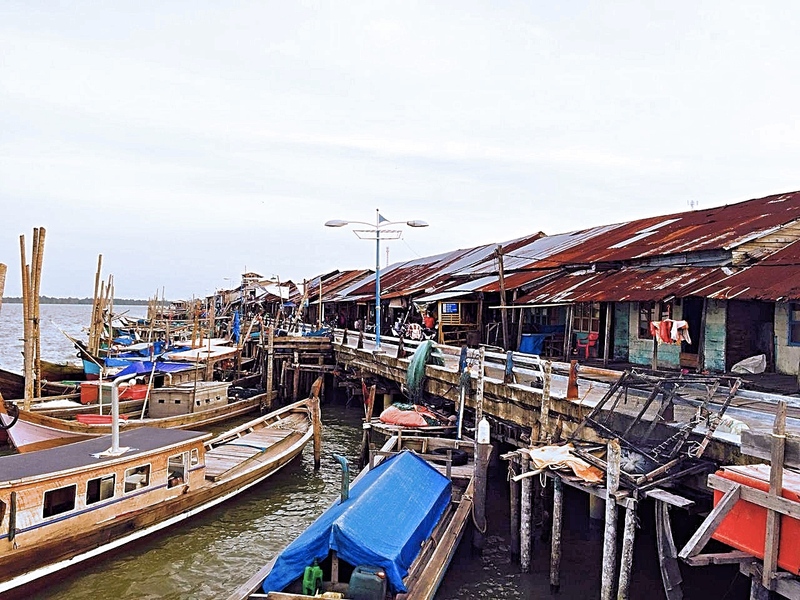 No matter how many years I passed, I could always look back on the uniqueness of this village; I knew I’d always be able to close my eyes and smell the salty and muddy river-sea breeze of Kampung Laut, the not-so-tiny village that’d always be remembered. The main benefit of collecting together the memories I had about my dad’s hometown was the fact that it created the event that I used to flash back to days gone by.